Hey guys, it's been awhile since my last post. I've been getting back into realflow lately, and have a question for the avid python scripters out there. I'm tasked with making a boiling liquid. I know this has been talked about and I may use those options. But I was thinking of something that is much lighter on sim time. My idea was to emit dumb particles from below a realwave mesh. Then calling a python script on collision with the realwave mesh I would kill the dumb particles and emit liquid particles in a spherical shape and have an outward force to create the splash. 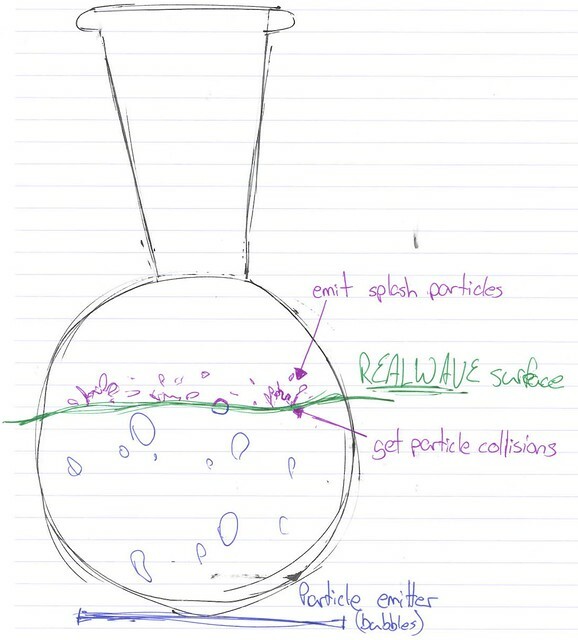 What I need to know is if there is a way to make a list of the particles colliding with a realwave mesh. I can't find much in the docs about particle and realwave interactions, and the "emitter.getCollidingParticles" command only returns particles that are colliding with geometry not realwaves or other particle system. Does anyone have a solution for this? The idea behind this system it to make it very light on sim time so speed up our production. Thanks guys. Just thought I would update you guys on what I'm doing. I've figured out how to get the particles position at impact. I would like to know a better way to doing this but this is what I've got so far. First, apparently realwave can't detect collisions from particles on it's reverse side. So I've had to flip over my sim. Kinda silly but it works. So, I've set my bubble particles to collide and then "on surface" setting to Place. I'm running a python script that gets the position and kills the bubble particle if it moves less than a given tolerance. I'm working on emitting the splash particles. I would like to know if anyone has an idea of how to emit particles in a spherical formation. Rather then emit from one point. I would like to tell my emitter to emit say 1000 particles in a given radius from a given point. I've exactly the same problem on a production. I ll let u know if i find something. "Do not feed the trolls"
wow holycause, that's awesome. Great script. I really liked this idea but after talking with my supervisor it won't work for this shot. I'll actually be going with something very similar to what tmdag posted. But I will come back to this later. And I'll share what I find on it. Thanks guys. In our case, we can't use only particles, we have to use RWs. The big reason we are going with a full particle sim is because we have a clear container and we want to see the interaction of the bubbles and the liquid below the surface. Like I said, I'll probably be revisiting this later when I'm not swamped with other things, cus I totally want to get this to work. I always prefer to work procedurally, because it's much easier to repeat things later.